It's not only her natural beauty and elegant style. She was an example of kindness and hearthfull quality human condition that were proved by her conducts no minded if there were out of the monarch protocol rules and establishment. Once have known and passed through adverses love experiences, also the certain true reality that was behind her election to be the one decided to satisfy the crown aspiration and conditions to be the wife of Charles Prince, but not for his sincere love to her, she was able to develop different faces and rolls of her condition. Firstly as a mother directly in contact with her children by her way. Then as a women that personally cared about human conditions in direct contact with was suffering diseases, disabilities, old people, also children with different capacities, the most poor ones, those what needed help and love. It´s a memorable demonstration of her known posture against war, violence and use or arms her voluntary act of going over a camp full of explosive mines. It was a sincere injustice the way that she loosed her life when she seemed to have finally had get an affective and stable state of happiness. Victim of the worst kind of reporters, the ones that have no respect, codes, limits, with one only purpose and objective no mind what pain or consequences of their way to manage in order to get photographs and news: paparazis persecution. 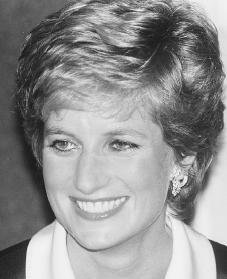 As it was the oficial information about the tragic accident that caused her death when she was 37 ears old date 29 of august year 1997.